Sorry! is a board game that is based on the ancient Cross and Circle game Pachisi. Players try to travel around the board with their pieces faster than any other player. Originally manufactured by BCM (British Card Manufacturers) in England and now by Hasbro, Sorry! is marketed for two to four players, ages six through adult. The game title comes from the many ways in which a player can negate the progress of another, while issuing an apologetic "Sorry!" 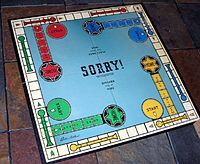 A classic edition of Sorry! is currently produced in the US by Winning Moves. The objective is to be the first player to get all four of their color pawns from their start location to their "home" space. The pawns are normally moved in a clockwise direction, but can be moved backward if directed. Movement of pawns are directed by the drawing of a card. The board game is laid out in a square with sixteen spaces per side, with each player assigned his or her own colored Start location and Home locations offset towards the center, one per side. Four five-square paths, one per color, lead from the common outer path towards a player's Home and are designated his or her "Safety Zone." On each side are two "Slides," grouping four or five spaces each. Older versions of Sorry! contain a colored "diamond space" directly one space back from each start square, with the rules stating that a pawn of the diamond's color may not move forwards over this square. Instead, a player of that color must diverge from the outer square towards his or her "Home." Although the diamond and corresponding rule were removed from subsequent printings of the game, the rules of player movement remained the same. The earliest variation of today's Sorry! can be traced back to England. William Henry Storey of Southend-on-Sea filed for a patent. Sorry! was registered as a trade mark on 21 May 1929 (UK number 502898). Early games were manufactured by BCM (British Card Manufacturers). A Canadian patent followed in 1932. An English patent was granted to the inventor in 1933. It was subsequently trademarked in the UK to Waddingtons, the British games manufacturer who sold it from 1934. Sorry! was adopted by Parker Brothers in 1934. Hasbro now publishes it, as they purchased Parker Brothers in 1991. Each player chooses four pawns of one color and one player is selected to play first. Each player in turn draws one card from the stack and follows its instructions. To begin the game, all of a player's four pawns are restricted to Start; only a 1 or 2 card can release them to the rest of the board. Playing a 1 or a 2 places a pawn on the space directly outside of start; playing a 2 does not entitle the pawn to a second space. The Relaxation Start; When a young player is playing especially when learning the game of Sorry! a relaxation is offered in allowing one of their pawns to be placed on their Track-Start-Space this means they don't get bored before they even start, in that they feel a part of things rather than the tedium of waiting for a 1 or a 2, which can be a bit wearisome even for experienced players. A player can jump over any other pawn, landing on the square indicated by the card. However, two pawns cannot occupy the same square. A pawn that lands on a square occupied by another "bumps" that pawn back to its own Start. Players can not bump their own pawns back to Start. If the only way to complete a move would result in a player bumping himself, the pawns remain in place and the player loses his or her turn. If a pawn lands at the start of a slide (except those of its own colour) by direct movement or as the result of a switch with the 11 card or a Sorry card, it immediately moves to the last square of the slide. All pawns anywhere on the slide are sent back to their respective Starts. The last five squares before home are the "safety zone." Access is limited to those pawns of the same color. Pawns inside the zone are immune to being replaced by an opponent's pawn with an 11 or a Sorry! card. However, a pawn is vulnerable to being forcibly moved backward out of the safety zone. Forced backward moves can cause a pawn to exit the zone. Also, you cannot move your pawn backwards and forwards and count it as a space, no matter what card you have, it is not allowed to move backwards and forwards. The modern game has now 45 cards. A 1996 board from Waddingtons has 5 of each card. In the 2013 Edition, several rules were changed. Each player only has three pawns. A pawn can be moved out from Start upon any positive number card. A Sorry! card gives the alternative option of moving forward 4 spaces. The 2 card no longer allows one to pull another card. Furthermore, two additional items known as Fire and Ice were added, and depending on which card is drawn, can be placed on certain pawns on the board, modifying the playing rules for those pawns. In short, fire gives a pawn the ability to move ahead quickly before the player's turn, and ice stops a pawn from being moved (or killed) at all. There are some corner cases that are not well explained in the rules, such as "What happens to fire if one pawn kills the pawn with fire by landing on its square?". Should the fire be set back to out of play, or should it transfer to the attacking pawn? Move a pawn from Start or move a pawn one space forward. Move a pawn from Start or move a pawn two spaces forward. Drawing a two entitles the player to draw again at the end of his or her turn. If you cannot use two, you can still draw again. Move one pawn seven spaces forward or split the seven spaces between two pawns (such as four spaces for one pawn and three for another). This makes it possible for two pawns to enter Home on the same turn, for example. The seven cannot be split into a six and one or a five and two for the purposes of moving out of Start. The entire seven spaces must be used one way or the other or the turn is lost. Move a pawn 10 spaces forward or one space backward. If a player cannot go forward 10 spaces, then one pawn must go back one space. Move 11 spaces forward or switch places with one opposing pawn. A player that cannot move 11 spaces is not forced to switch and instead can forfeit the turn. Move a pawn 12 spaces forward. Move any one pawn from Start to a square occupied by any opponent, sending that pawn back to its own Start. If there are no pawns on the player's Start, or no opponent's pawns on any squares, the turn is lost. If an enemy's pawn is swapped while it is in front of your HOME, your pawn is switched EXACTLY where your enemy's pawn is, not at your HOME. Players who have a pawn that has not moved too far away from its start area, and draw a card that allows them to move a pawn backward, can (and should) elect to move this pawn backward. Move a pawn in such a situation backward enough, and the pawn is suddenly almost home. The 7 can be split; it is often possible to do so such that one of the pieces winds up on a slide, thus increasing the value of this card. It also provides an additional opportunity for pawns to get Home, so long as there's another pawn on the board to use up the remaining spaces. All other things being equal, moves that cause a pawn to wind up in front of an opponent's start square are poor choices, due to the high number of cards that allow that opponent to enter. Some feel that leaving a pawn on one's own square just outside "Start" (also known as the "Dot") is a poor position to be in since new pawns are blocked from entering play. Another smart move requires two pawns in play: While marching one pawn around the board, a player can leave a second pawn near "Start" (within two squares of the dot) and wait for the 4 card to be drawn and moving the second pawn into position to run quickly "Home." Slowing the game down is a risky yet effective move when given the opportunity. Essentially, when a player has the chance to switch with or hit the apparent leader, even though the move will not be to the player's immediate advancement around the board, the move should be made to keep the leader out of "Safety" and more importantly, out of "Home." The Sorry! card is normally the card that is least appreciated from the person who receives the action. Players can elect to play the game in two teams of two. Red's teammate is always yellow and blue's teammate is always green. The game is then played as if two players had eight pawns each: for example, the yellow player may move a red pawn for any legal move. A 7 card could be split between a yellow pawn and a red one but can still be split between no more than two pieces. However, a partner's pawns are not "bump-proof": if yellow were to draw a Sorry! card with only red pawns on the board, or land on a red pawn's occupied space, yellow would have to bump its teammate. Once one of the partners has played all of his or her pieces into home, he continues to draw and play cards on his or her turn, if possible, for his or her partner. The first partnership to play all eight pieces in its home wins. A variation with more scope for strategy allows for each player to play the card of his or her choice from a hand of pre-dealt cards. This variation is played by shuffling a full deck of Sorry! cards, and selecting a dealer. Five cards are dealt face-down to each player. Starting player selection is decided by normal play rules. For each turn, a player picks one card from his or her hand and plays it face up. Normal rules apply. If a 2 is played, he may play another card. Being unable to play a card after playing a 2 card does not warrant the reshuffle rule, however; if able to play another, he must. At the end of the turn, that player picks up however many cards were played face-down. End rules apply. This variation is commonly coupled with point-play, noting that it is usually produces faster and more aggressive play. Similar to regular game rules, a player must play a card if able. If a player is unable to play a card (called a dead hand), that player must discard one card and draw another face-down. If the player is able to play a card, the player must do so. If the player is able to play multiple cards, the player may choose freely which one to play. Another version, similar to the above, involves dealing out the entire deck of cards before play starts. The same rules apply as the previous variation except with very different strategy. Namely, it forces players to think about when they play certain combinations of cards. For example, if a player's first move is to lay down a 2 followed by a 4, allowing himself to finish on his or her following turn, his or her opponents would probably stop him or her with a Sorry card or an 11, effectively wasting the first player's 2 and 4. Rather than playing a combination like this early in the game, it is often wise to save them until the end, when all the Sorry cards and 11s have been played. Note that players who have 2s in their hand will appear to have less cards at the end of each round than players who do not. Bump 'Em: Similar to the Sorry! card in the traditional game. Take one bumper car currently in pit row. Choose an opponent's car. Take their place and send them back to pit row. If the player has no cars in pit row, he must pass. The board also comes with oil slicks, which act as the Slides! and landing on a persons bumper car will "bump" them back to pit row. Variation rules apply (Five cards in hand style play, see "Variation"). The winner is decided by achieving a certain amount of points over a span of several games. To any player with X number of his or her own pieces in home (X being the number of pieces in home at game's end). A electronic gaming version of Sorry! was released in 1998 as a Sorry! computer game. Hasbro Adventure! : The Action Pack - with Twister, Connect Four, and Trouble. Sorry! The Greatest Hits: The FULL Pack! - Had 5 editions of the game, chosen randomly. NOTE: Many of these themed editions have special rules on the 3, 5, 8 & 11 cards that specify special movement rules for players if their color matches the one named on the card. Key Quest (neopets version) Similar to Sorry!, but more Neopets-like. Shakin' Sorry! Dice'n'Grab Edition: Dice-based game, where the object is to roll enough of your color face to fill your HOME board. U-Build Sorry: Part of Hasbro's U-BUILD series, which had a Lego-like board that allowed for custom paths, and a modified game goal of "escorting" pawns from the center of the board to your HOME space. Color pawn - The player takes the corresponding color pawn from the start base and, if it matches up with the color of his or her home base, puts it in his or her home section. If not, it is put in his or her waiting area. When there are no more pawns of a particular color in the Start base and a player rolls that same color, he can take that color pawn from another player’s waiting area, not his or her Home section. Sorry! - Take a pawn from the home section of one player’s home base and keep it. Wild Pawn - The player may take any color pawn from the Start base or waiting areas (not the Home section of another player) and keep it. Slide - Change either ones own Home section or someone else’s Home section to a different color. The first person to get four pawns of the same color in their home section wins.